A growing crop of second-generation solid-state drives (SSDs) have shown us that we're well on our way toward realising the full potential of the proliferating SATA 6Gbps interface. But as is often the case with high-performance SSDs, second-gen drives such as Intel's 510 Series and OCZ's Vertex 3 offer blazing performance at an increased cost of almost £2-per-gigabyte. Sure, the speed bump on offer from the latest SandForce controller is nothing short of astonishing, but outside of benchmarks, will most users be able to tell the difference between a fast SSD and a very fast SSD? We're not so sure, hence why we'd still give the £155 120GB OCZ Vertex 2 a nod over the £215 Vertex 3 model of the same capacity. Striking a balance between price and performance is key, and it's precisely the reason for today's review of Crucial's second-generation solution; the m4 SSD. Launched as a successor to the award-winning C300, the new line of m4 drives offer a 17 per cent increase in read speeds and up to a 20 per cent boost in writes. A healthy step in the right direction, but here's the bit that really caught our eye: the m4 drive is available at a cost of roughly £85 for a 64GB SSD; £170 for a 128GB SSD; £340 for a 256GB SSD; and £675 for a 512GB SSD. On average, that's about £1.3-per-gigabyte, making the new drives fractionally cheaper than their C300 predecessors. What gives? Well, for starters, the m4 isn't a major shift from last year's C300. Both feature an eight-channel Marvell controller, Micron NAND, a 128MB cache and a SATA 6Gbps output, but a few subtle changes - including the use of a revised Marvell 88SS9174-BKK2 processor, cheaper-to-produce 25nm MLC NAND flash memory and a revamped firmware - help give the m4 a little extra speed. So exactly how much of a boost can we expect? 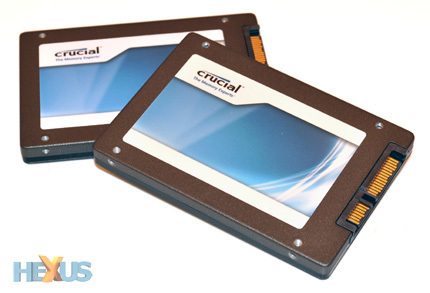 According to Crucial, the m4 is capable of sequential read speeds of up to 415MB/s, while sequential writes are rated at 95MB/s for the 64GB SSD, 175MB/s for the 128GB SSD, and 260MB/s for both the 256GB and 512GB models. Putting those numbers into perspective, last year's 128GB C300 drive was deemed capable of read and write speeds of up to 355MB/s and 140MB/s, respectively, making this year's model comfortably quicker when it comes to raw sequential throughput. On the flip side, random read and write performance has dropped slightly from 50,000 IOPs on the C300 to 40,000 IOPs on the new m4. 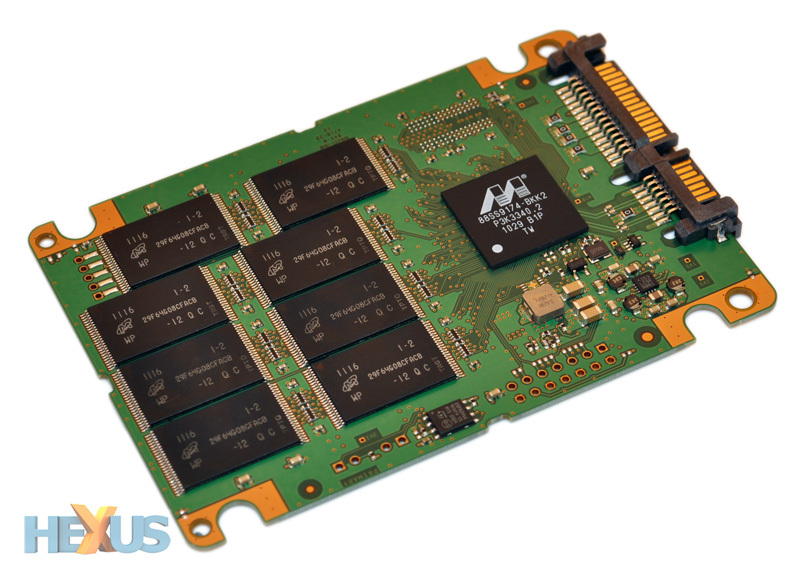 It's a delicate balancing act trying to get the most out of the Marvell controller, and to find out how well Crucial has done, we've got not one but two 128GB m4 SSDs to put to the test. As shown above, a single drive - with 16, 8GB Micron 25nm NAND flash modules - provides a formatted capacity of 119GB. 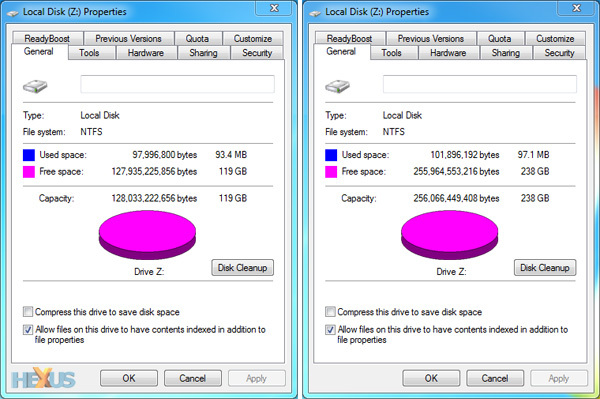 Putting two drives in a RAID 0 array at a cost of around £340 gives you exactly double the capacity, but will we see a 2x boost in performance?